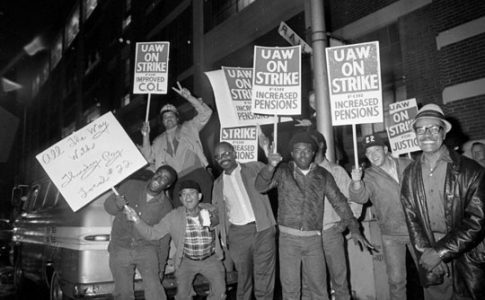 With the eruption of strike action by Chicago hotel workers, hotel worker William Lewis argues that the unions have the power to organize the unorganized, spread the strike nationally — and win. Image by Jose M. Osorio/Chicago Tribune via AP. 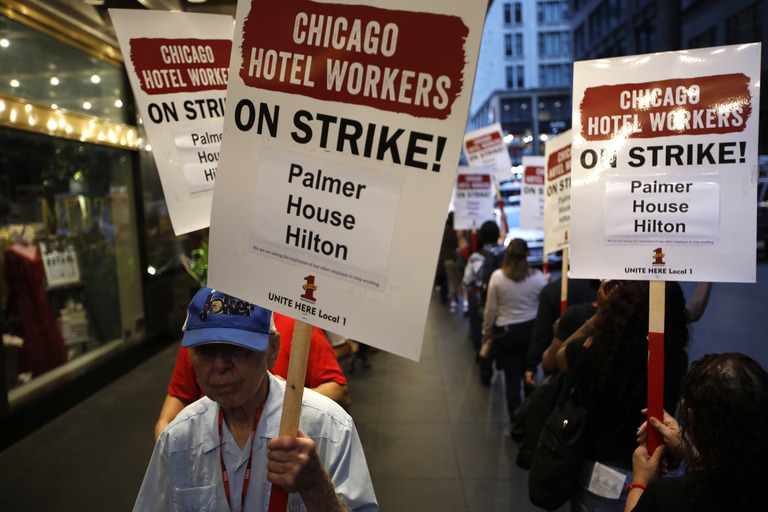 Ten days into the Chicago Hotel Strike, the struggle has not slowed, but has in fact grown. A 26th hotel has joined the initial 25 and there is little sign of the workers letting up. Hotels on strike include the Drake Hotel, Hyatt, Hilton, Holiday Inn, JW Marriott, Ritz-Carlton and more. 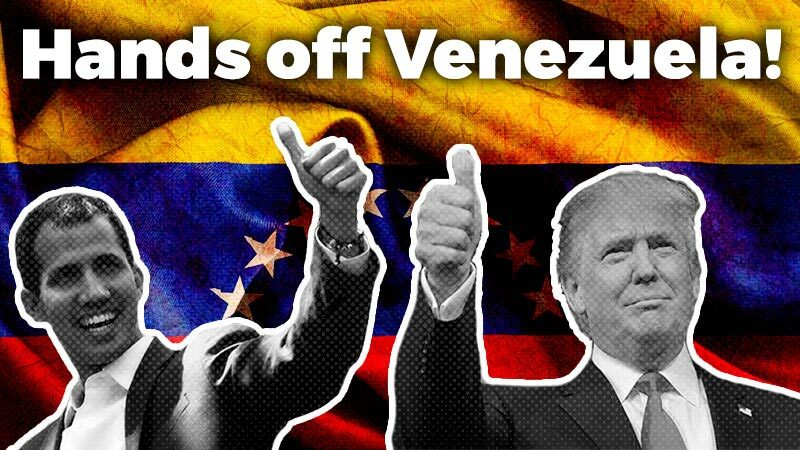 And they are not the only ones fighting. 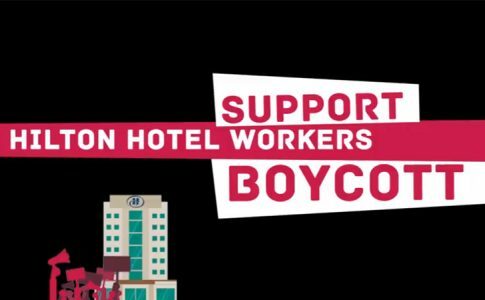 Thousands of hotel workers at Marriotts across the country have authorized to strike in at least 21 hotels in five cities. This number may very well multiply since UNITE HERE represents over 20,000 Marriott workers on the continent. In Chicago, Local 1 of UNITE HERE is in negotiations at 30 hotels. The contracts expired on August 31st and in the strike authorization vote 97% voted to strike. Their biggest demand? Year round healthcare coverage. It is common for hotels to lay off workers – many of whom are immigrant women – in the slow winter period between October and March, and with the layoffs come breaks in coverage. This means that hotel workers and their families suddenly are left without healthcare, despite illnesses that do not take a break during those months. This is unacceptable. Workers should have access to healthcare regardless of the occupancy of the hotels. Hotels that are making money hand over fist. Even according to the industry magazine, Hotel Management, 55 million tourists visited Chicago last year. Most needed a place to stay and many paid hundreds of dollars for a night’s stay. According to the Marriot’s 2018 first quarter report, earnings per share rose 15% from 2017 and a $398 million net income– a 7 percent increase from 2017. The same dynamic is seen in hotels around the country. It is clear that there is more than enough money for healthcare. But the bosses are never satisfied and are always demanding more for themselves. 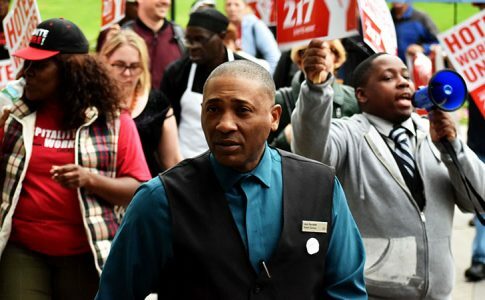 Nearly 6,000 hotel workers on strike across 26 hotels demonstrates the possibilities of workers fighting back against massive multinational corporations. For hotel workers like myself, its deeply inspiring. There are even rumors of workers in other sectors showing solidarity, such as UPS and Teamsters who refuse to deliver to hotels. It should be noted though, that four of the 30 hotels in negotiations are not yet on strike. It is unclear why these four hotels have not joined the 26 that are already on strike. And Local 1 represents a total of 15,000 workers in the city, far more than those who are in negotiations now. If they were to follow the strikers’ lead, they could shut the hotels down completely. Right now, the hotels are still running – barely – with subcontracted, temp agency labor. And a cursory glance of online reviews shows the impact of the disruption. A picket that stops work altogether and stops the scabs in their tracks will requires thousands of workers– which means joining in of other unions in the city. Could hotel workers, united with other sectors of workers take up the demand for universal healthcare, which has gained some national prominence? Could hotel workers unite with healthcare workers to demand quality healthcare? Could mass pickets shut down more than hotels– could they shut down the whole city? Contracts are negotiated hotel by hotel, so there is the possibility the strike winds down as hotels settle. These piecemeal contracts could be combated in favor of the fight for a master contract that represents the best standards not just for those in the union but also those workers not yet in the union. Again, this will require the participation of the whole of Labor, and would be another step forward for unions to represent working class interests even outside their memberships. Nonunion workers deserve improved conditions as well as unionized workers. 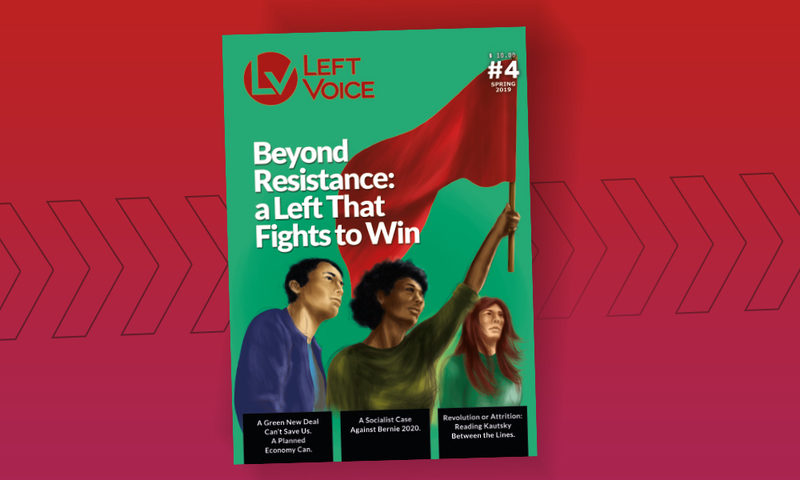 Representing both sectors– unionized and non-unionized serves to amplify and strengthen the struggle. Division is the enemy of the working class, and the larger the organization and contracts, the stronger the workers. Marriott workers understand this. On Monday, September 10th, Marriott workers in Waikiki and Maui, Hawaii authorized a strike with 95% of the vote. In Boston, this vote was repeated at 95% for a strike on September 12th, and the next day in San Francisco, 99% voted to strike. Seattle joined in with a strike vote on September 15 at the Westin Seattle. The possibility of a simultaneous strike across 21 hotels in five cities from coast to coast is a big advance. 7,800 workers may go on strike, hopefully joining the 6,000 workers already on strike. This could increase even more as there are 12,000 workers working without a contract and 20,000 UNITE HERE workers at Marriott hotels around the country. 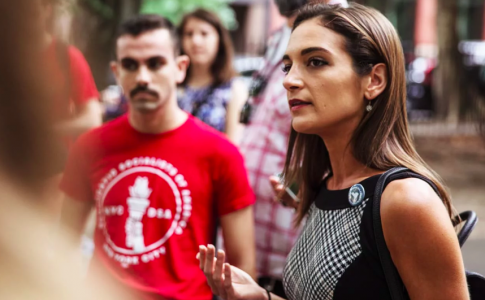 Hotel workers fighting against the largest hotel company in the world could provide the spark for organizing in the private sector, just as the militant teachers of West Virginia, Oklahoma and Arizona have done for teachers and other public sector workers. Who Won the NY Democratic Party Primary?